Description: 31T made its crew change at East Binghamton, and has now crossed the Susquehanna and is on the NS Tier. We see it at Liberty St at the start of the trip to Buffalo. The two tracks in the foreground, now the Johnson runner and the stub of track 4, were once the DLW east and westbound main tracks. This is also the approximate location of Liberty St tower. A track from the DLW station, out of view to the left, to the Syracuse and Utica Branches, crossed the Erie here. Description: CN train A-406 awaits a crew to head for Stevens Point, WI. Description: Charlie brings the transfer up to the light after coming up from Northtown. Description: The transfer moves light powered past the stored units at Northtown enroute to the T Yard. Description: The same power we had down here yesterday is down here again, but this time I got a much better shot of these two units. Description: A pair of CN Dash-9's lead an eastbound on the former GTW. 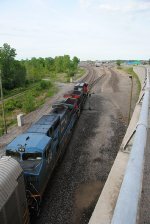 Description: A northbound, soon to be westbound autorack train comes up toward Durand from the Holly Sub. Description: In a very odd event, one of the crew members dismounted the train, and left, after the train had made the turn, I saw him just leave. Description: Dismounted, shift apparently over, waves goodbye to the remaining crew. Description: Ready to leave Lillooet for Squamish on the former BC Rail.